Sometimes I have extra berries, gettin’ all up in my business. 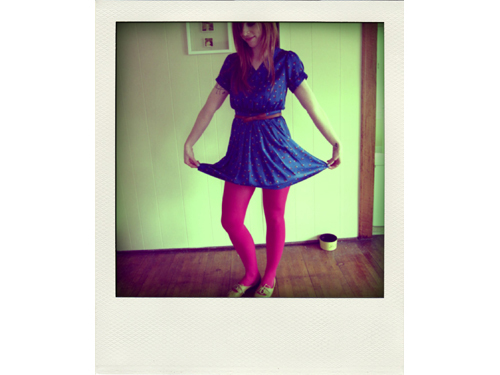 Sometimes I wear outfits that match my sorbet. Sometimes I take photos of frozen goodness at lunch. Sometimes white chocolate tastes best with berries. Sometimes white chocolate tastes best as a mushroom. Sometimes Elliot’s foot is in the top right corner of a photo of blended berries. I’m just trying to say that it’s always a good idea to blend berries with sugar and then freeze it. Just like it’s always a good idea to have a beer after work, walk your pup after dinner, and eat sorbet while watching crime shows or Bill Murray movies. 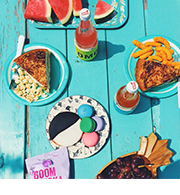 Oh, and sharing is good idea. Here you can have this one! I just ate one bite of it. Slice the strawberries and toss with other berries and sugar in a medium bowl, stirring until the sugar begins to dissolve. Cover and let stand for 45 minutes to 1 hour, stirring every so often. 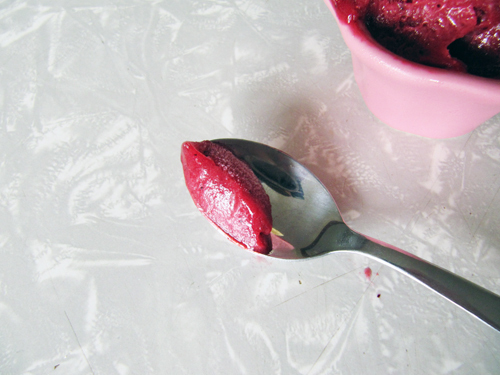 Purée the berries and their liquid in a blender with lemon juice and salt until smooth. Press the mixture through a fine mesh strainer to remove the seeds. Chill mixture for a couple hours and then freeze in your ice cream maker according to the manufacturer’s instructions. Top with white chocolate to serve. 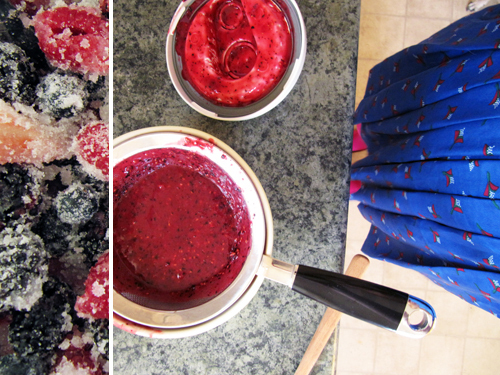 My berry berry sorbet matchy matchy outtfit. white chocolate in mushroom form! so cute! 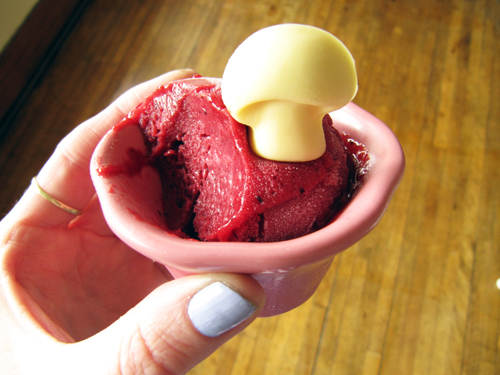 the berry sorbet is such a pretty color…like your sweet tights. Thanks Cindy! I need more tights in my life. I’m wearing them out! the mushrooms are adorable! I need to get into sorbets! This one looks intensely lovely. Thanks Dana! You should totally try this. I bet you’ll love it! Beckie – Thanks guuuuurl. The mushrooms totally are Super Mario Brothers-esqe. I just want to play nintendo now. Lucy – Thanks! 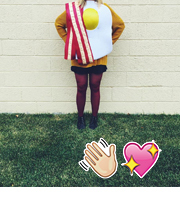 Oh, you should totally get one. A pistachio colored one would sure be the dreamiest! Nice one! 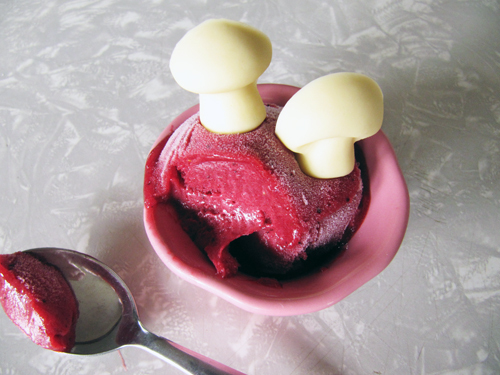 Those mushrooms really looks so delicious on strawberry sorbet! l would love to know where to get or how to make those white chocolate mushrooms for a buche do Noel. Can you tell me? They are cuter than ANY I’ve seen! I bet they’d look lovely on a buche de noel!